I had a super fun morning today hanging out at Little Farm in Tilden Park with Victoria, Luis, Eleanor and Sebastian. Berkeley has many special places but one of my favorite is Tilden Park. It’s a wonderful park with all sorts of great trails and activities, and only ten minutes from my house. 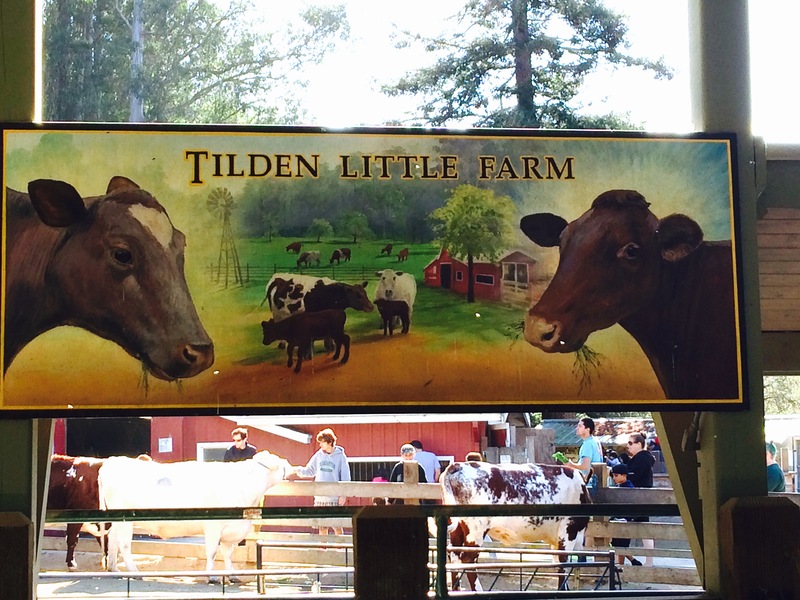 One of my favorite Tilden places for spending time with kids is Little Farm. As the name says, Little Farm is a “little farm” and petting zoo for kids. They have sheep, goats, cows, geese, chickens, rabbits and some really portly pigs. “That’s a lot of bacon!” was a common (if not very creative) refrain from the adults. What I love about little farm is that the “farm hands” are all older kids (middle school age) who come spend their weekends at the farm introducing the little ones to how to brush, clean, and feed the animals. We came prepared with our bags of lettuce and celery and had a great time feeding and petting the animals. Eleanor was an old pro and did a great job of showing her little brother Sebastian that, despite the giant tongue, the mama cow was only interested in the celery and not his hand!